Described as ‘a large compilation of diverse and exciting music from new and exciting artists,’ VA1+2 is, first and foremost, a fundraiser for Alzheimer’s Research UK. Arguably, that’s reason to purchase it in itself, but of course, in truth, any compilation sells on the basis of the music. 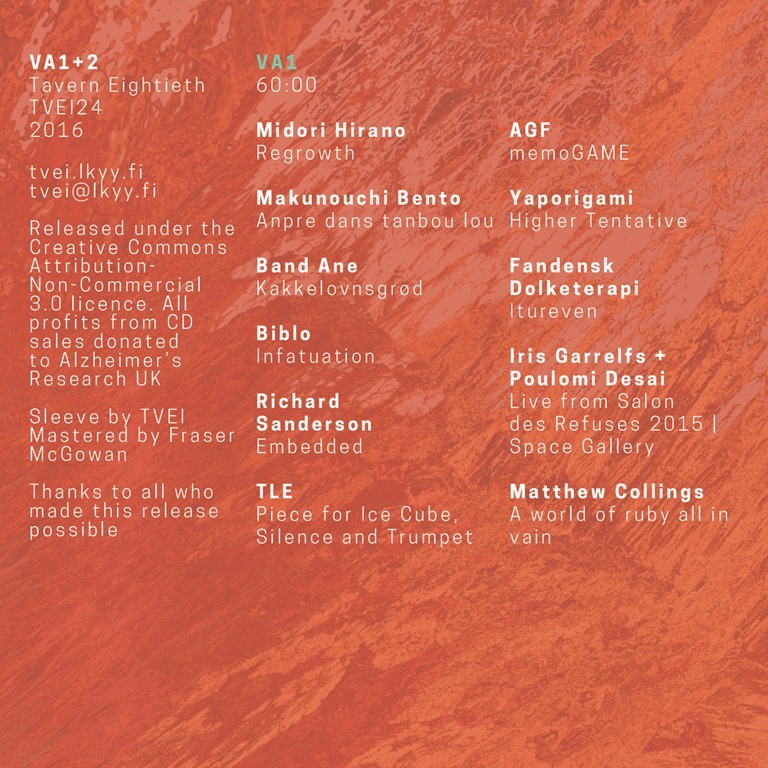 The immense range of music on offer on VA1+2 is its real strength, and offering over two hours of music (that’s 22 tracks by 22 different artists packing out a brace of discs), it’s a veritable boon of contemporary electronic, ambient, experimental, electro-acoustic, improvisational and more. From the semi-ambience of Midoro Hirano’s ‘Regrowth’ and the swampy Latina stylings of Manouchi Bento’s ‘Anpre dans tanbou lou’, there’s much to soak in on disc one. Band Ane’s bleepy, space-age ambient Krautock is particularly intriguing. Disc two spans the dolorous yet delicate piano-led instrumental of International Debris’ ‘Translucent Orb’ to the eerily ominous ‘Kiki and Bouba’ by Isnaj Dui, via the ethereal transcendental post-punk folk hymnals of ‘This Thought Won’t Last’, the contribution from Zelienople and Glacis’ elegiac epic ‘As long as water flows’. One of the common pitfalls of compilations, and in particular compilations to raise funds for charity, is that they’re often a bit of a hotch-potch mess, no better than the naff giveaway discs that come with magazines (or used to come with magazines: I don’t know as I stopped buying magazines some time ago, at the point when the quality of features and reviews vs cover price became unfavourably skewed toward the latter) plugging whatever was hot at that moment in the eyes of that publication, with a bunch of album tracks and B-sides taking up the majority of the space. VA 1+2 feels – and sounds – very different. Tavern Eightieth haven’t just taken anything that’s been floating around, and while I despise the overuse of the word in our post-postmodern hipsterised word, there’s a sense that they’ve actually curated a compilation which represents the label. There’s clearly a lot of thought and effort gone into this, from the selection of material itself to the mixing and sequencing of the tracks. And so, while it is a fundraiser, and for an extremely meritorious cause (I’ll spare the lecture here on the underfunding of research into Alzheimer’s given the number of people it affects). Finally, mastered by Fraser McGowan with an ear on optimal clarity and dynamic range over volume, there’s a sense that every aspect of this release is about doing the music justice. And in turn, they do the charity and the listener justice. Everyone wins.